My interpretation of the photo inspiration from Catch the Bug is actually quite literal but these Scribbles digis I had complemented Santa so well, in my opinion. 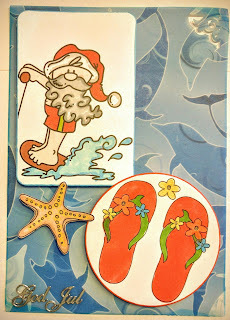 I'm also entering my card into these challenges: QKR Stampede (By the Seaside), Fussy and Fancy (Christmas in July) and Sparkles Monthly (Christmas in July). Wow love your Photo Challenge card! Thanks so much for Joining in our CIJ Week long evet at Catch the Bug! Thanks for using a Bugaboo Image! Great card and perfect background paper. Thanks for using a Bugaboo image and joining us in our CIJ at Catch the bug. This is so perfect for our photo inspiration challenge!!! Thanks for joining us at Catch the Bug Challenges for Christmas in July! What a fun card! Glad to see Santa relaxing. Thanks for sharing this cutie with us for the QKR Stampede weekly challenge! Love your fun card! Its matches the theme perfectly, thanks for entering our christmas in july week. Fun Santa card. Thanks for sharing with QKR Stampede. Thanks for joining us at Sparkles Monthly Challenges blog and good luck !